Women on a Mission: Mom Edition: MOUTHWATERING MONDAY: Last-Meal-On-Earth Potato Salad! MOUTHWATERING MONDAY: Last-Meal-On-Earth Potato Salad! As I mentioned here, I was intent on trying out my hand at deviled-egg potato salad like we had from Baker’s grocery store at Dad’s in Omaha over Memorial Weekend. It was PHENOMENAL, to quote my friend MC when she’s describing yummy food. I figured I could follow basic potato salad principles, then guesstimate from there. Thrifty Nana (my Mom), Dad and our families (shout out to Aunt Pam!) taught us pretty well when it comes to cooking. And it’s not just the follow-a-recipe kind of cooking, it’s the use-your-knowledge-and-improvise kind of cooking. (Don’t get me wrong, there are plenty of times when I follow a recipe b/c the recipe is just plain awesome, and baking isn’t really an ‘improvise’ kind of deal-i-o on the whole.) Well, I was determined to make deviled-egg potato salad, seeing as I can’t run to Baker’s in Omaha every time I get a hankering for it. 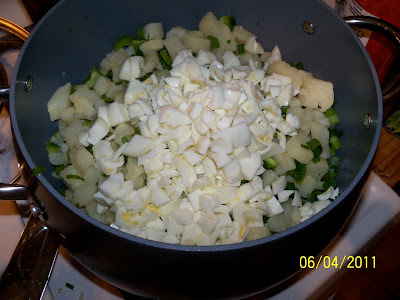 So this was on my mind when I set about to make my own deviled-egg potato salad. 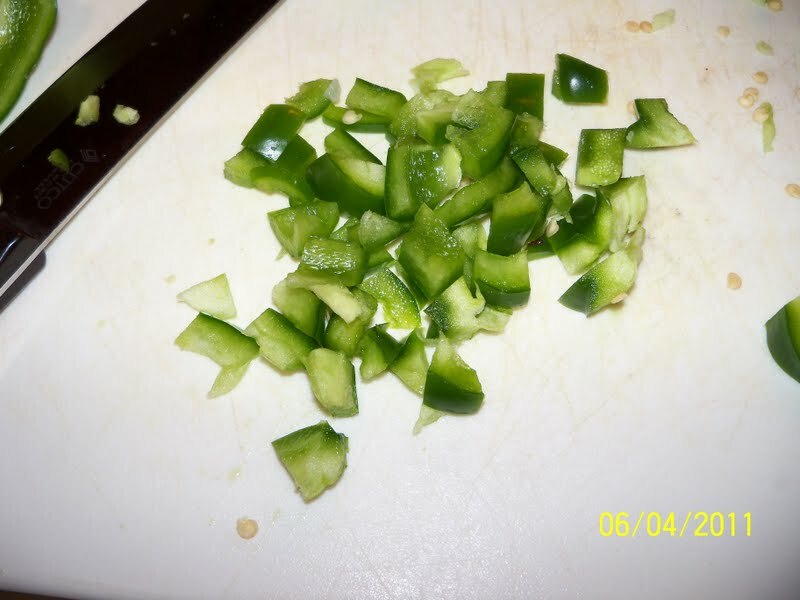 Green pepper - later in the summer they'll be home-grown too! If you like other stuff like *radishes* in your potato salad, be my guest and add it. Boil the whole potatoes for 20 minutes in a large pot. Drain and allow to cool completely. Boil the eggs – put them in cold water, bring to rolling boil then immediately remove from heat and allow to sit in the hot water for exactly 15 minutes, covered (this is the BEST way to hard boil eggs to get a clean peel from the shell and yolks that are perfect). 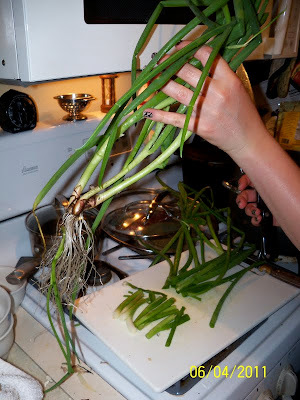 Then drain and douse in cool water until you can handle them with your hands. While these things are a-bubbling, you can chop your other ingredients. Peel the eggs when they’re still warm – it’s way easier. 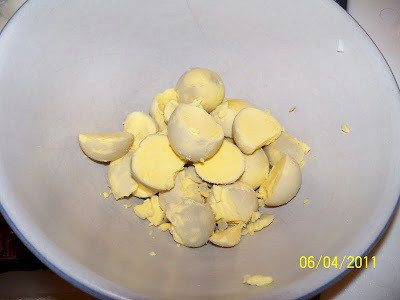 Cut in half and take out the yolks; put those in a separate dish. Chop up the whites finely and put in the same bowl as your other chopped ingredients. 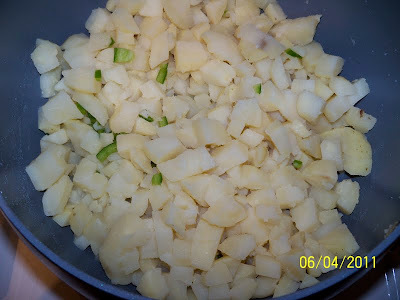 Peel the potatoes and cut into cubes – combine with the other ingredients, but do it gently so they don’t get mashed up. ~Coarse ground Dijon mustard – about ½ cups, plus more to taste. You can use smooth Dijon or yellow mustard if you like, but I liked the look of the mustard seeds, and I prefer Dijon to yellow in potato salad. Mash the 12 egg yolks with a fork. Add a lot of Miracle Whip. Add the Dijon mustard. Stir till well-combined. Taste. Does it need salt and pepper? You decide. I used several shakes of both. Stir around again. 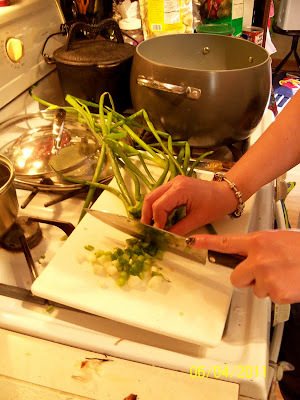 Stir the sauce with the other ingredients, and be gentle, in a large bowl. You don’t want to break up the potatoes to mush. When it’s well-mixed, taste it. Is it a little dry? 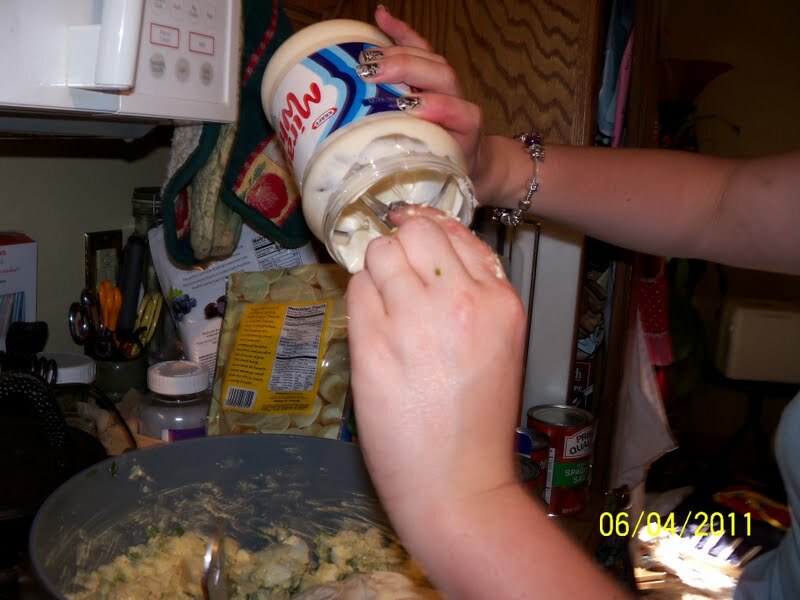 Add more Miracle Whip, about a ½ cup at a time till you like the taste/consistency. Does it need more salt & pepper? Add till you like it, but don’t make it too salty as a rule. When you serve, shake with *paprika* for pretty. I recommend that you make any potato salad the day ahead. It’s always better the 2nd day. Oh yeah, I did it. Not too bad, huh? It’s not super hard and you’ll LOOOOOOVE the end result. Perfect for upcoming events like Father’s Day (if you’ve got a meat-and-potatoes guy like those in my life) and the 4th of July. I won’t be upset if you claim the glory for yourselves – except be sure you tell the guests at your parties to follow our blog!! !